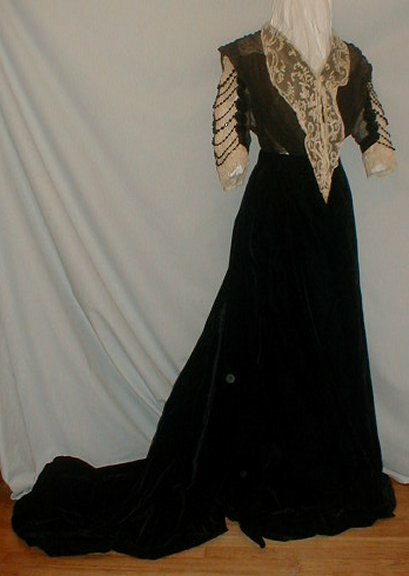 An elegant 1912 Edwardian black silk velvet evening gown. The label reads Mrs. C. Donovan Co. 29 East 55th St. New York. 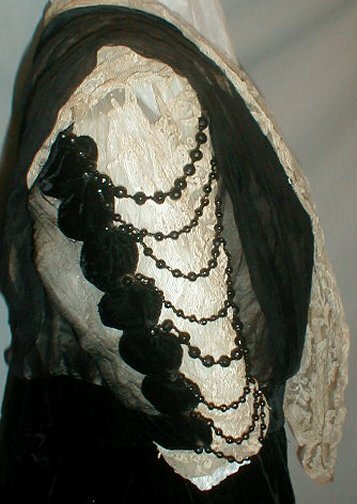 The bodice is made of black silk chiffon and has a layer of ivory lace under the chiffon. 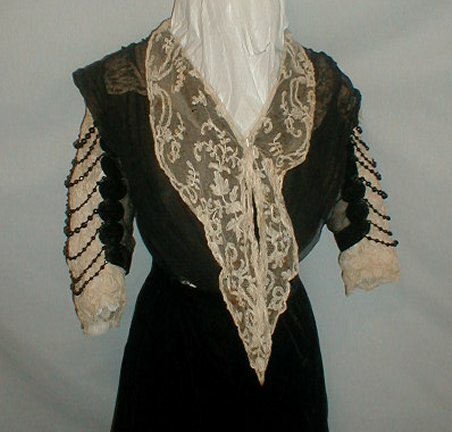 The neckline is decorated with a wide lace embellishment. 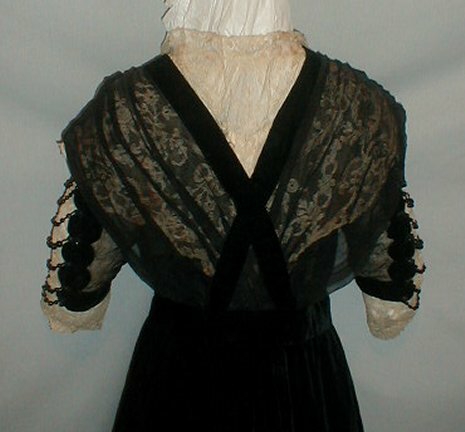 The sleeves are made of the same lace and black chiffon. There are eight roes of black swag beading on the sleeves. 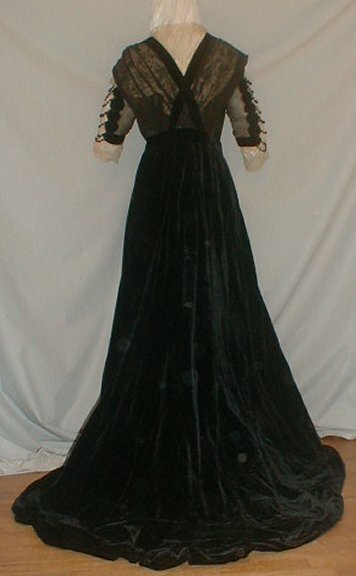 The sleeves are also trimmed with black velvet circles. 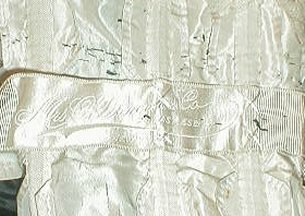 The bodice is lined with white silk. 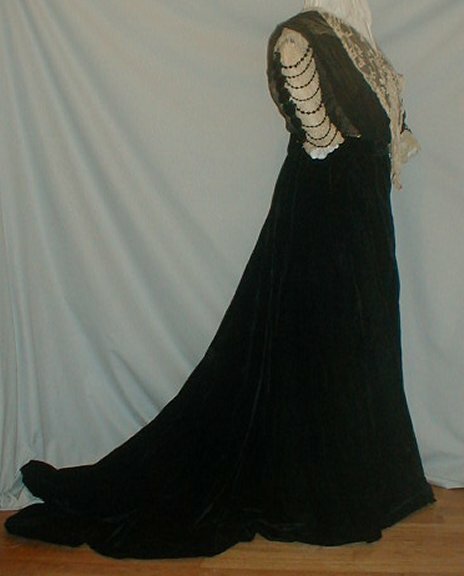 The skirt has a long back sweep and is lined with black silk. The dress has a front hook and eye closure. The dress is in very good and sturdy condition. It is generously sized. There is splitting on the lining in the bodice and right at the front waistline the black chiffon has separated exposing the white lining and will need some minor re-stitching. There is a slight line of underarm discoloration on the inside lining. Bust 36 Waist 30 Front skirt length 40 Back length 57.